As part of the preparation for any trip, I first research the area using Gaia GPS. I will either create a track based on the Open Hiking map that comes installed or will load a GPX track I’ve found elsewhere. Either way, once you have a track created, you can tell Gaia GPS you want to download maps for the track. You then choose which overlays you want to have. I always choose the Open Hiking and Satellite with Labels layers since they can be very helpful when figuring out where you are and where you want to go next. We like them so much, we want you to get a discount for signing up with them. 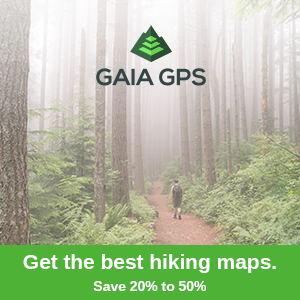 I consider Gaia GPS to be one of the essentials for any trip. I’ve recommended it to many friends just because it works so well. You can also get a discount if you click through the link below.